2014-2015. WELCOME  This presentation is intended for Registered Student Organizations (RSOs) with members who plan to travel and expect to be reimbursed. 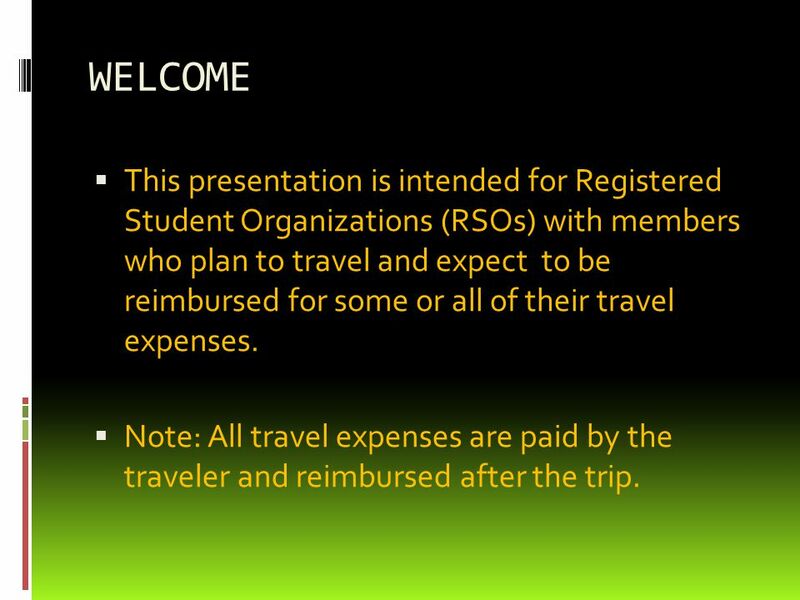 2 WELCOME  This presentation is intended for Registered Student Organizations (RSOs) with members who plan to travel and expect to be reimbursed for some or all of their travel expenses.  Note: All travel expenses are paid by the traveler and reimbursed after the trip. 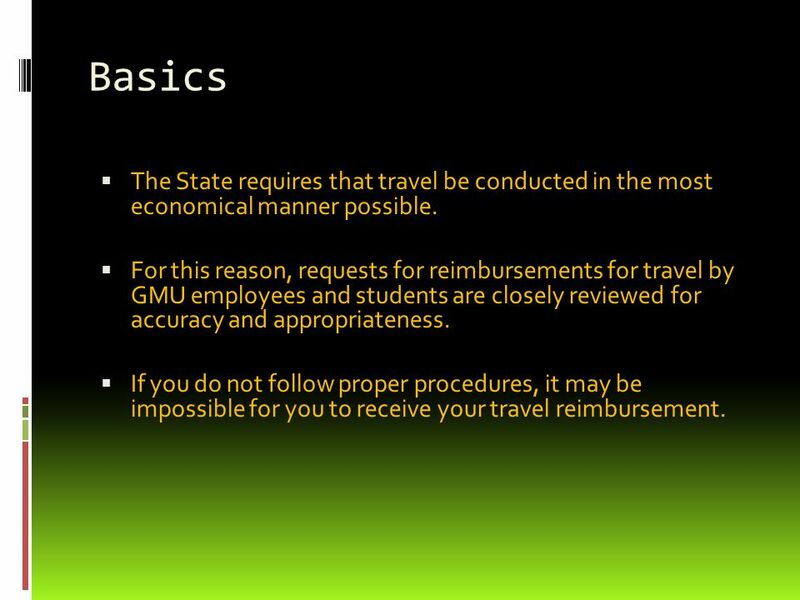 3 Basics  The State requires that travel be conducted in the most economical manner possible.  For this reason, requests for reimbursements for travel by GMU employees and students are closely reviewed for accuracy and appropriateness.  If you do not follow proper procedures, it may be impossible for you to receive your travel reimbursement. 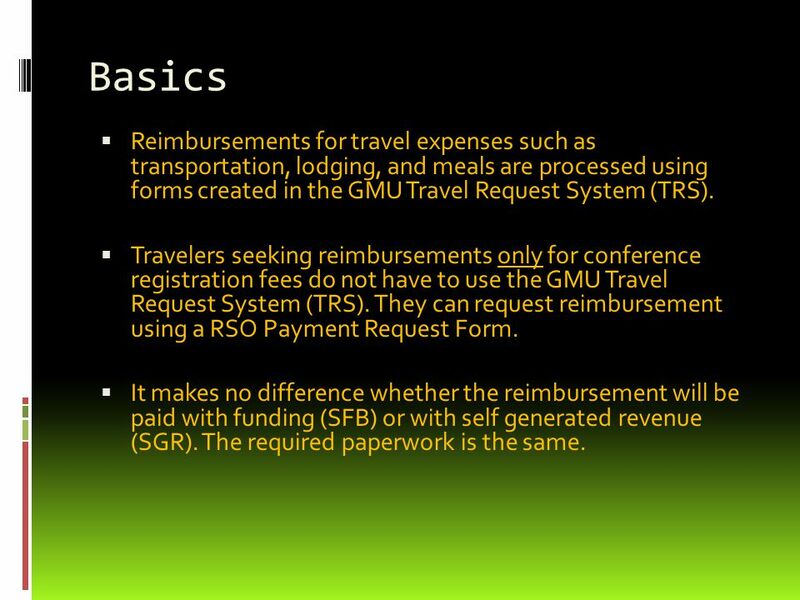 4 Basics  Reimbursements for travel expenses such as transportation, lodging, and meals are processed using forms created in the GMU Travel Request System (TRS). 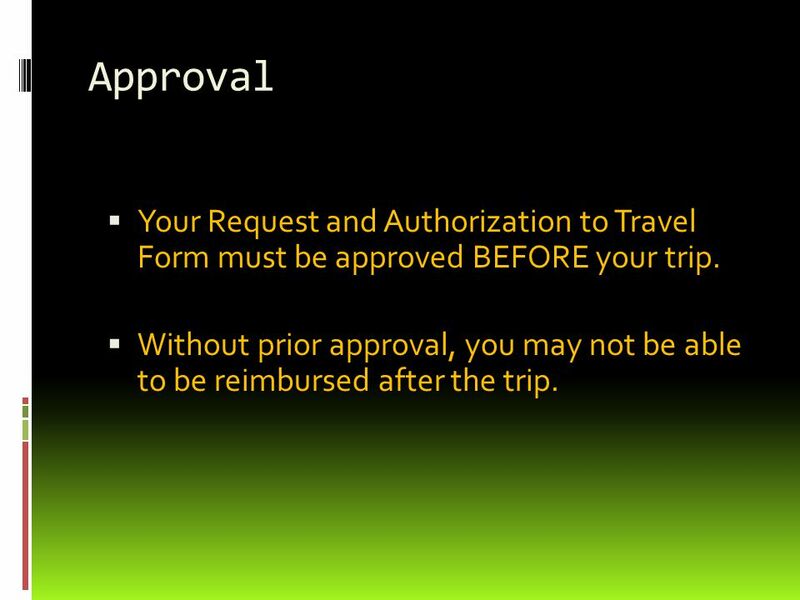  Travelers seeking reimbursements only for conference registration fees do not have to use the GMU Travel Request System (TRS). They can request reimbursement using a RSO Payment Request Form.  It makes no difference whether the reimbursement will be paid with funding (SFB) or with self generated revenue (SGR). The required paperwork is the same. 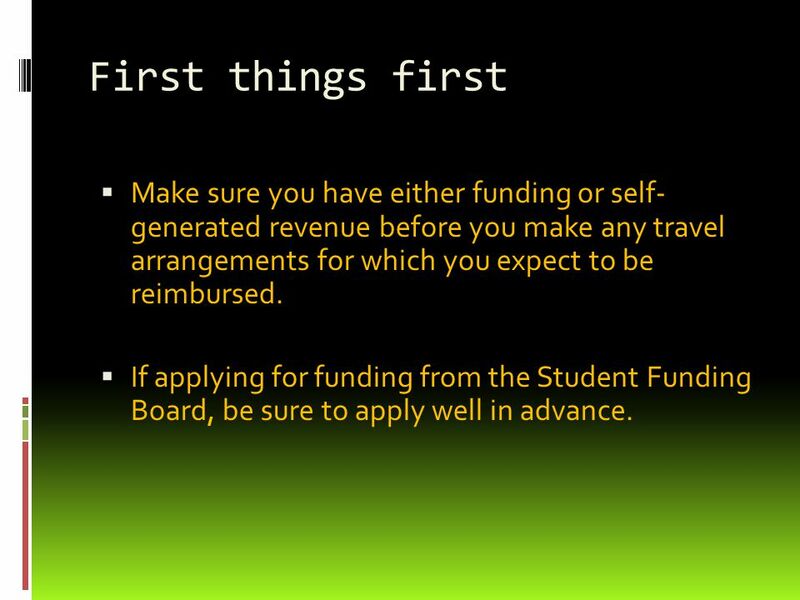 5 First things first  Make sure you have either funding or self- generated revenue before you make any travel arrangements for which you expect to be reimbursed.  If applying for funding from the Student Funding Board, be sure to apply well in advance. 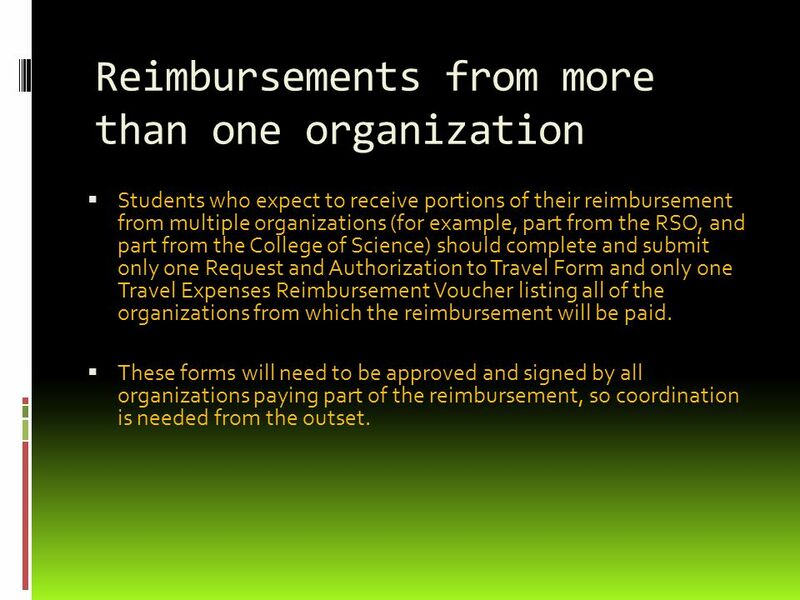 6 Reimbursements from more than one organization  Students who expect to receive portions of their reimbursement from multiple organizations (for example, part from the RSO, and part from the College of Science) should complete and submit only one Request and Authorization to Travel Form and only one Travel Expenses Reimbursement Voucher listing all of the organizations from which the reimbursement will be paid.  These forms will need to be approved and signed by all organizations paying part of the reimbursement, so coordination is needed from the outset. 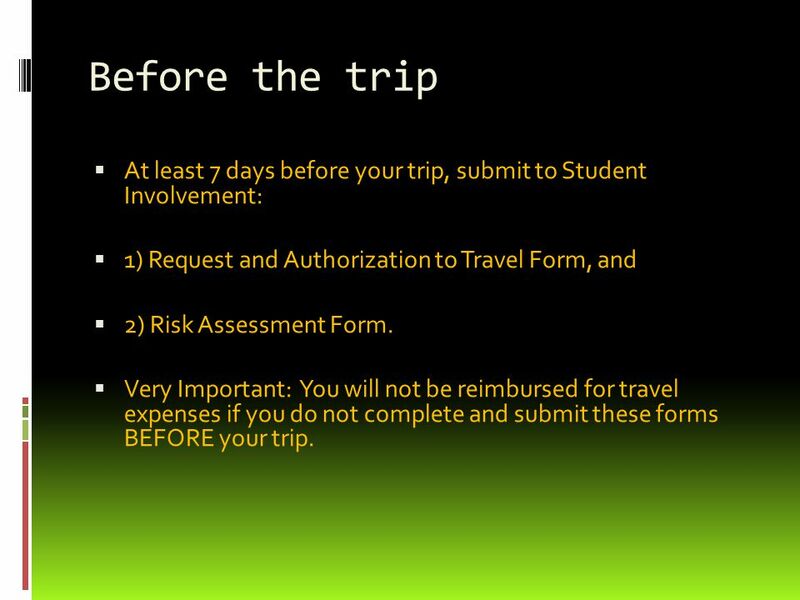 7 Before the trip  At least 7 days before your trip, submit to Student Involvement:  1) Request and Authorization to Travel Form, and  2) Risk Assessment Form.  Very Important: You will not be reimbursed for travel expenses if you do not complete and submit these forms BEFORE your trip. 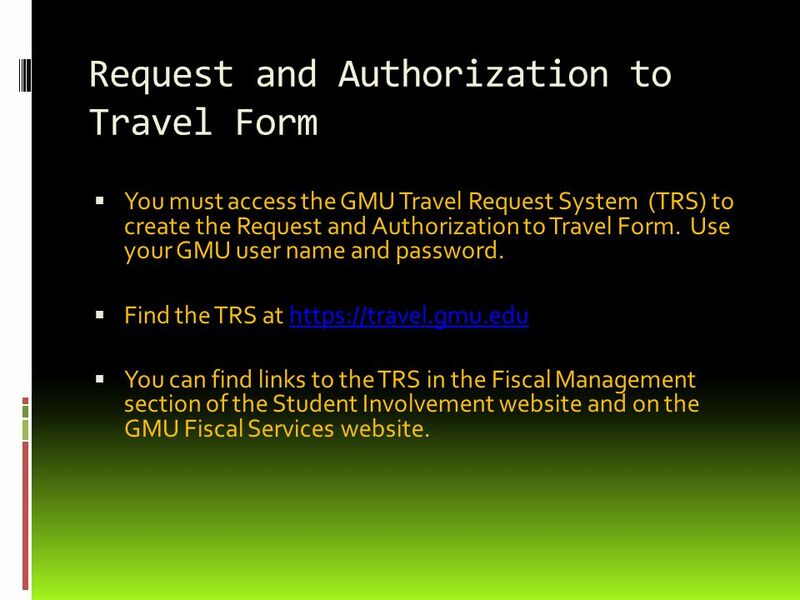 8 Request and Authorization to Travel Form  You must access the GMU Travel Request System (TRS) to create the Request and Authorization to Travel Form. Use your GMU user name and password. 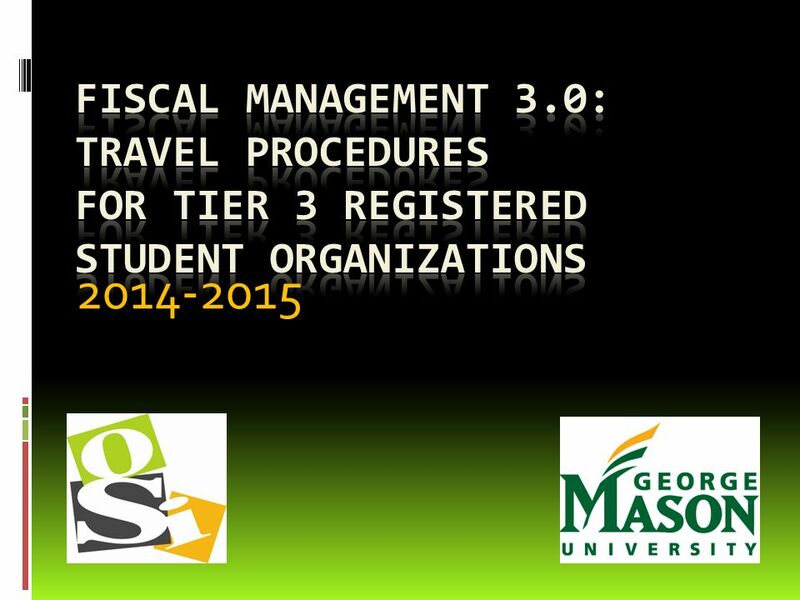  Find the TRS at https://travel.gmu.eduhttps://travel.gmu.edu  You can find links to the TRS in the Fiscal Management section of the Student Involvement website and on the GMU Fiscal Services website. 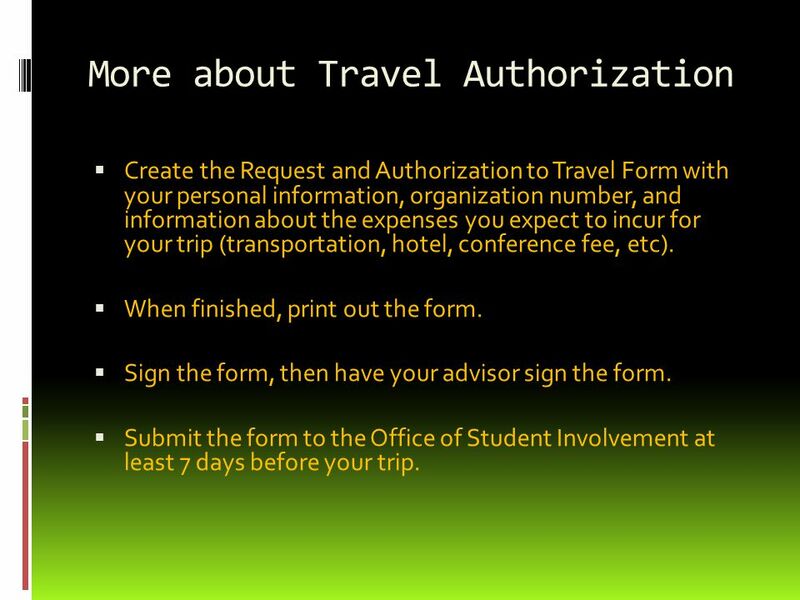 9 More about Travel Authorization  Create the Request and Authorization to Travel Form with your personal information, organization number, and information about the expenses you expect to incur for your trip (transportation, hotel, conference fee, etc).  When finished, print out the form.  Sign the form, then have your advisor sign the form.  Submit the form to the Office of Student Involvement at least 7 days before your trip. 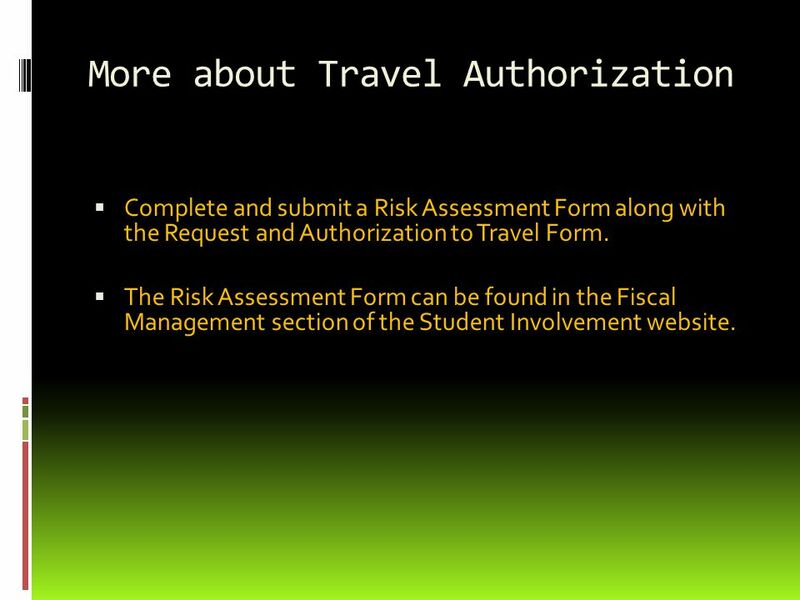 10 More about Travel Authorization  Complete and submit a Risk Assessment Form along with the Request and Authorization to Travel Form.  The Risk Assessment Form can be found in the Fiscal Management section of the Student Involvement website. 11 Approval  Your Request and Authorization to Travel Form must be approved BEFORE your trip.  Without prior approval, you may not be able to be reimbursed after the trip. 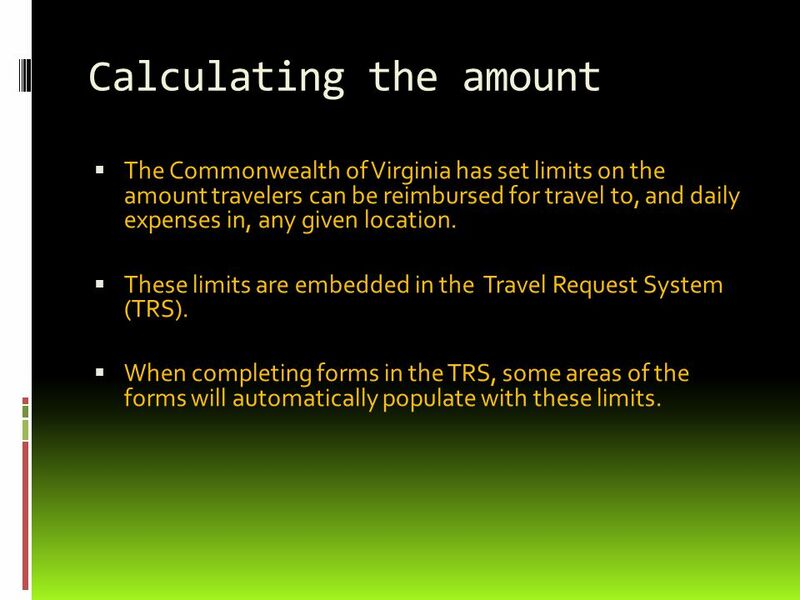 12 Calculating the amount  The Commonwealth of Virginia has set limits on the amount travelers can be reimbursed for travel to, and daily expenses in, any given location.  These limits are embedded in the Travel Request System (TRS).  When completing forms in the TRS, some areas of the forms will automatically populate with these limits. 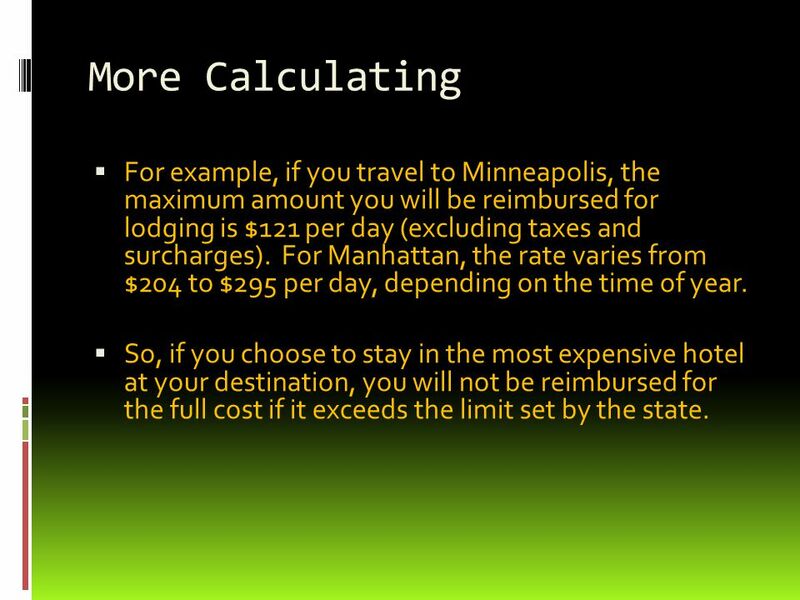 13 More Calculating  For example, if you travel to Minneapolis, the maximum amount you will be reimbursed for lodging is $121 per day (excluding taxes and surcharges). For Manhattan, the rate varies from $204 to $295 per day, depending on the time of year.  So, if you choose to stay in the most expensive hotel at your destination, you will not be reimbursed for the full cost if it exceeds the limit set by the state. 14 While traveling  Travelers must have original receipts for all expenses, except for meals which are reimbursed on a per diem basis. 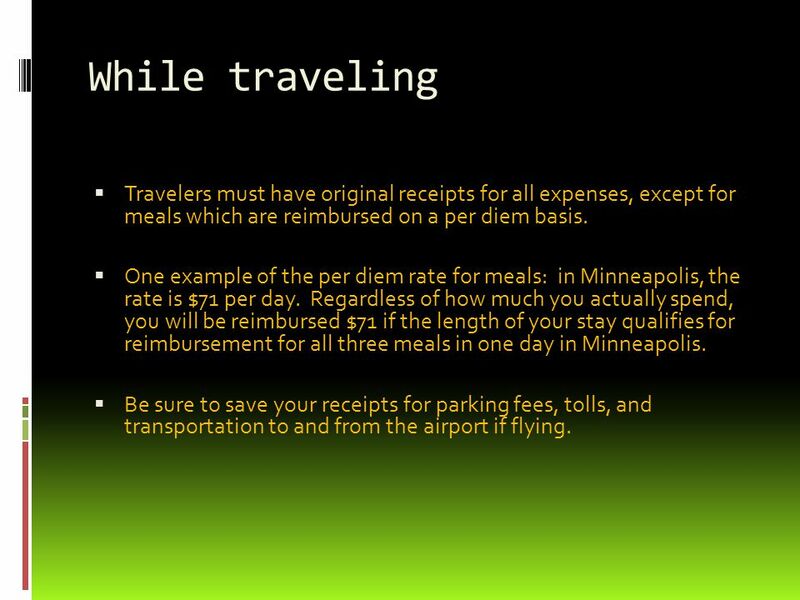  One example of the per diem rate for meals: in Minneapolis, the rate is $71 per day. Regardless of how much you actually spend, you will be reimbursed $71 if the length of your stay qualifies for reimbursement for all three meals in one day in Minneapolis.  Be sure to save your receipts for parking fees, tolls, and transportation to and from the airport if flying. 15 After the trip  Within 3 weeks after your trip, use the Travel Request System to create a Travel Expenses Reimbursement Voucher.  Print out the Reimbursement Voucher and sign it.  Have your RSO advisor sign the Reimbursement Voucher.  Attach your original receipts and submit to Student Involvement for approval. 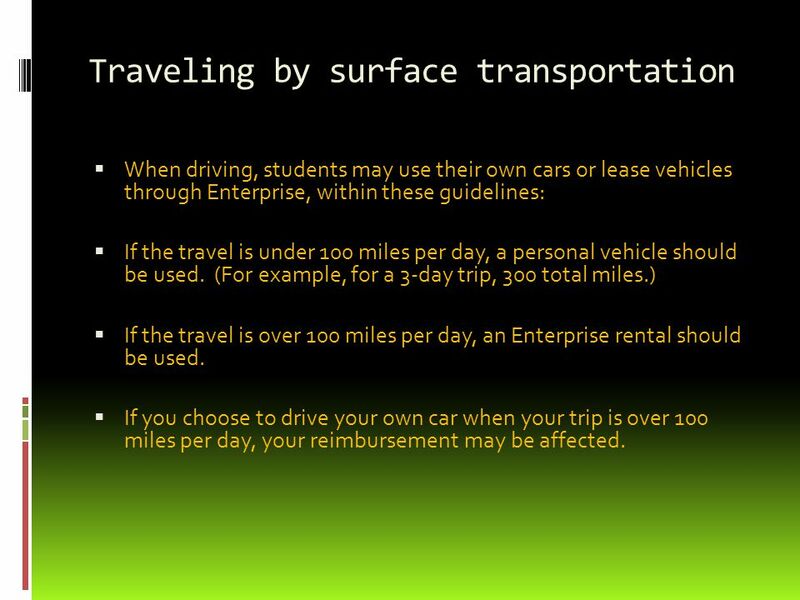 16 Traveling by surface transportation  When driving, students may use their own cars or lease vehicles through Enterprise, within these guidelines:  If the travel is under 100 miles per day, a personal vehicle should be used. (For example, for a 3-day trip, 300 total miles.)  If the travel is over 100 miles per day, an Enterprise rental should be used.  If you choose to drive your own car when your trip is over 100 miles per day, your reimbursement may be affected. 17 Enterprise  Students must be 21 years old to rent from Enterprise. 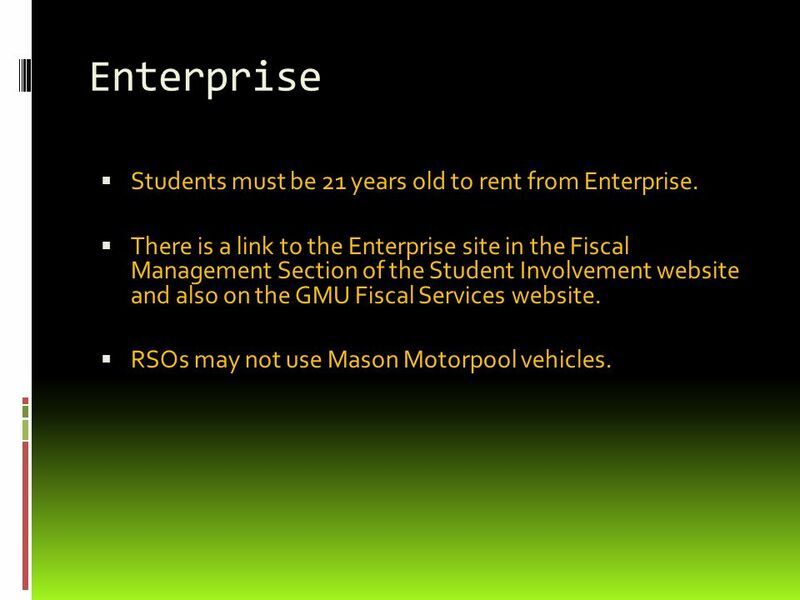  There is a link to the Enterprise site in the Fiscal Management Section of the Student Involvement website and also on the GMU Fiscal Services website.  RSOs may not use Mason Motorpool vehicles. 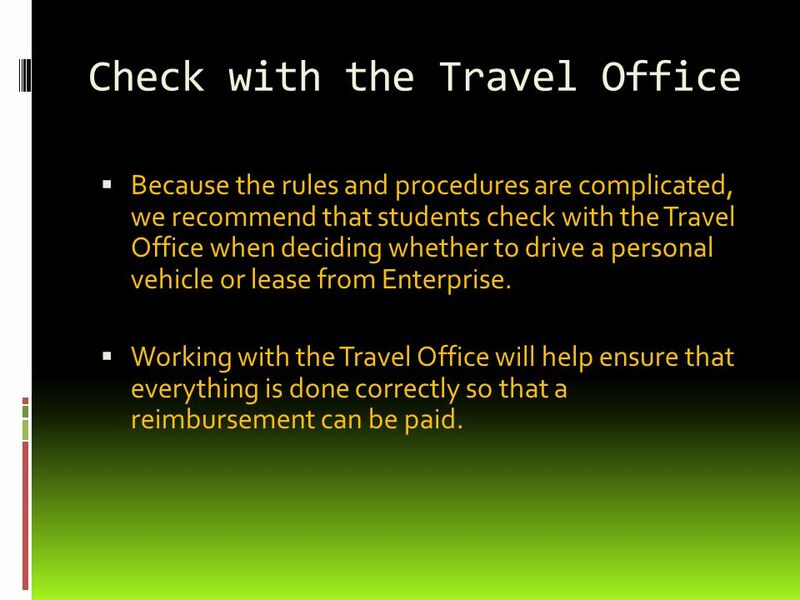 18 Check with the Travel Office  Because the rules and procedures are complicated, we recommend that students check with the Travel Office when deciding whether to drive a personal vehicle or lease from Enterprise.  Working with the Travel Office will help ensure that everything is done correctly so that a reimbursement can be paid. 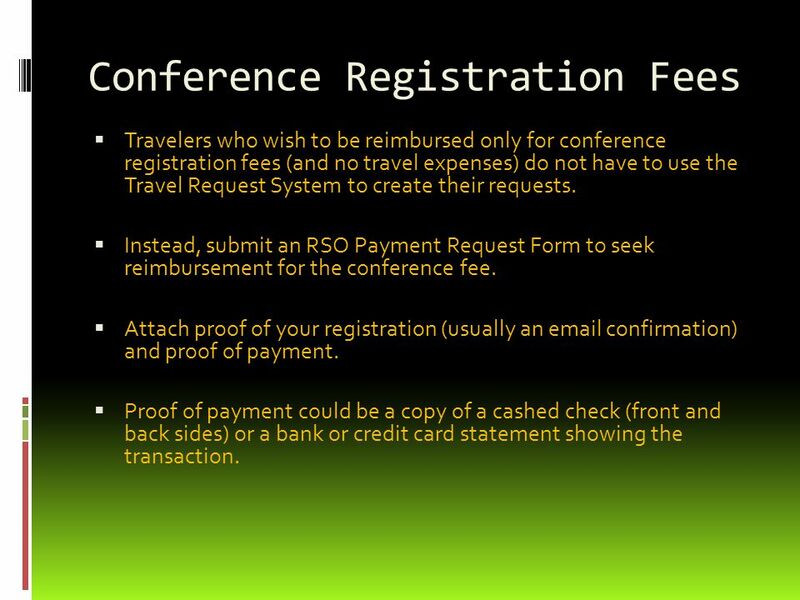 19 Conference Registration Fees  Travelers who wish to be reimbursed only for conference registration fees (and no travel expenses) do not have to use the Travel Request System to create their requests.  Instead, submit an RSO Payment Request Form to seek reimbursement for the conference fee.  Attach proof of your registration (usually an email confirmation) and proof of payment.  Proof of payment could be a copy of a cashed check (front and back sides) or a bank or credit card statement showing the transaction. 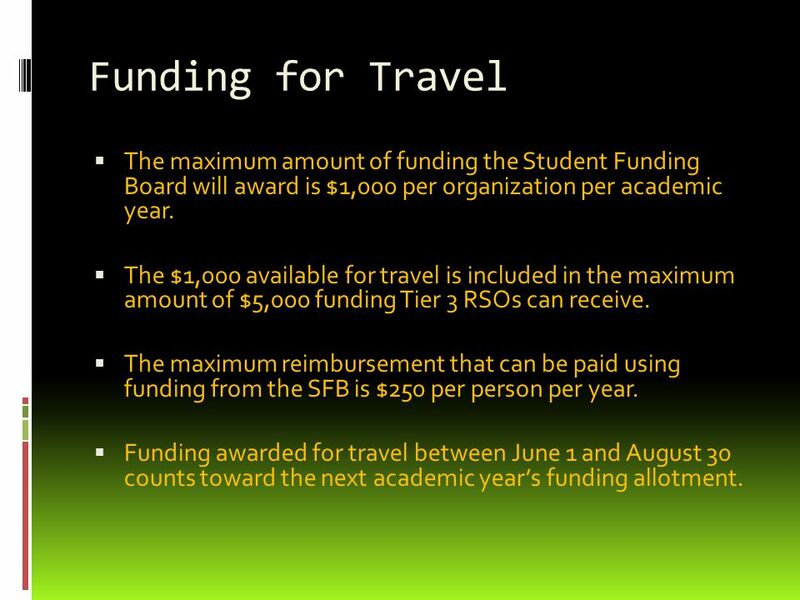 20 Funding for Travel  The maximum amount of funding the Student Funding Board will award is $1,000 per organization per academic year.  The $1,000 available for travel is included in the maximum amount of $5,000 funding Tier 3 RSOs can receive.  The maximum reimbursement that can be paid using funding from the SFB is $250 per person per year.  Funding awarded for travel between June 1 and August 30 counts toward the next academic year’s funding allotment. 21 SGR Reimbursements  There is no limit on the amount of reimbursement that can be paid per person using self-generated revenue (SGR). 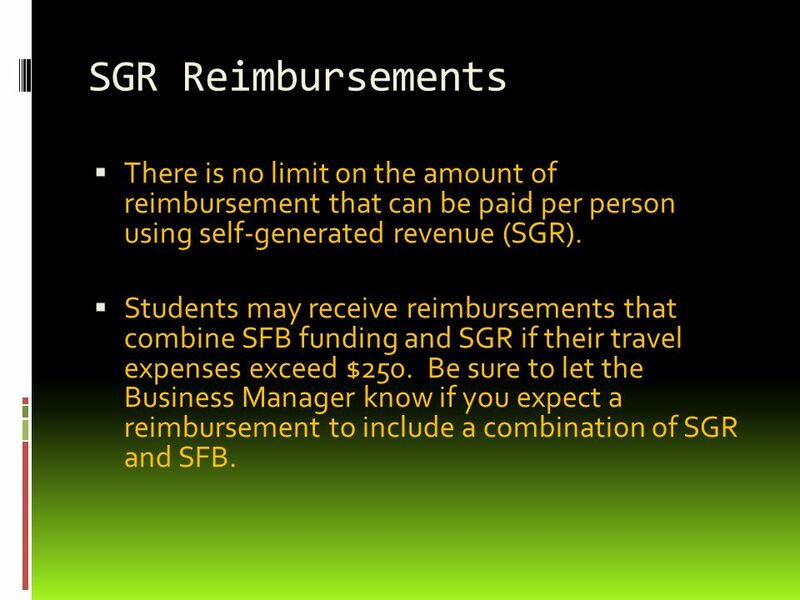  Students may receive reimbursements that combine SFB funding and SGR if their travel expenses exceed $250. Be sure to let the Business Manager know if you expect a reimbursement to include a combination of SGR and SFB. 22 The End  This concludes Fiscal 3.0 training: RSO Travel Procedures. 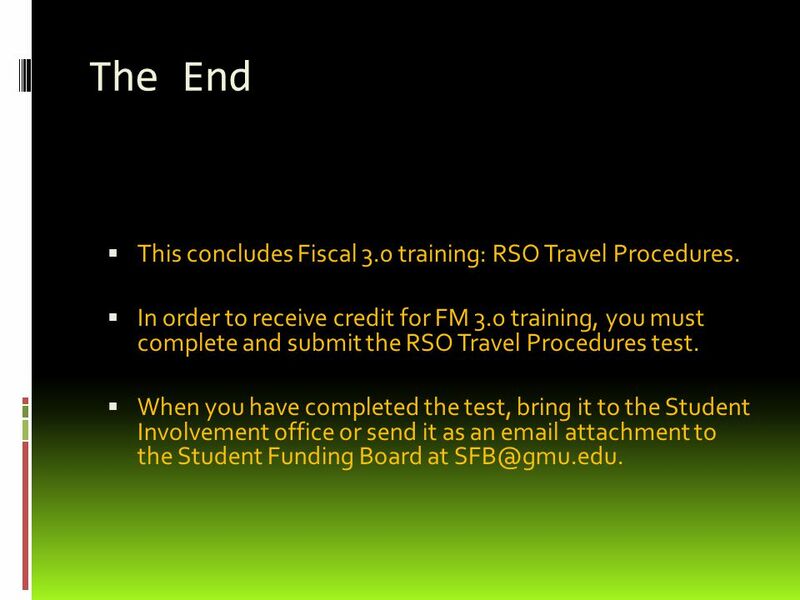  In order to receive credit for FM 3.0 training, you must complete and submit the RSO Travel Procedures test.  When you have completed the test, bring it to the Student Involvement office or send it as an email attachment to the Student Funding Board at SFB@gmu.edu. Download ppt "2014-2015. WELCOME  This presentation is intended for Registered Student Organizations (RSOs) with members who plan to travel and expect to be reimbursed." UW-Whitewater Procurement Card Travel Program. Travel Procurement Card Program The Travel Procurement Card is a payment tool available to individual employees. The current CTA Accounts will be eliminated effective July 1, Personalized NYS Travel Visa Cards (cards will be Grey) will be issued to all NYS. 6/3/2014Travel-cko 1 New Coordinator Training Session Two CLOSING OUT A BUSINESS TRIP. The University of Texas System Administration Travel Policy Travel Services And Accounting & Purchasing Services. A.Travel Authorization Form (BO-0600) B.Travel Voucher Form (BO-0500) C.Employee In-District Mileage Reimbursement And Authorization Form & Mileage Log. 4/27/2015 University Travel Information CSU Dominguez Hills. Financial Services Travel Training June 24, 2014. 2013-2014.  This workshop contains information about depositing and spending money from a GMU student organization account.  Additional information.